Photo from the author’s collection. Inset is the Kearny Medal. Capt. 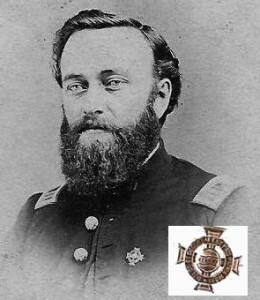 Solomon T. Lyon of the 5th Michigan Infantry has been described as a recipient of the Kearny Medal and there is a photo that seems to prove it. The trouble is that, not only was Capt. Lyon not on the official list of recipients, but he apparently didn’t qualify to receive the medal. So what’s going on here? The trouble is that Capt. Lyon wasn’t even in the army in January, 1863 – much less as an officer serving under Gen. Kearny. According to his Compiled Service Record (and as supported by his pension application and other documents), he mustered in as a 2nd Lieutenant of Co. E, 5th Michigan Infantry on 24 April 1864 – more than 15 months after the qualification period ended. He was promoted to 1st Lt. in July and to Captain in November of the same year. There is evidence that a few other officers (and one woman) who were not on the official list of recipients were later awarded the medal. But they proved to meet the qualifications or they were awarded with some fanfare as a gift by the commanding officer, Gen. Birney, or (in the case of the woman) by a group of high-ranking officers. No such evidence has been found regarding Capt. Lyon. Furthermore, in stark contrast to most other recipients, there is no reference to the medal in his pension application, published biographies, contemporary newspapers, or his obituary. As mentioned previously, a committee of officers designed the Kearny Medal and documented a list of the officers who were qualified to receive it. But there is no evidence of a benefactor, sponsor, or fund that was developed to pay for its manufacture. Rather, the evidence indicates that (with a few special exceptions), each qualifying officer was required to purchase his own medal. * So perhaps Capt. Lyon simply purchased one? It would seem not. The committee of officers that designed the medal were specifically instructed to “take bonds from the manufacturers of the medal, sufficient to prevent them from disposing of the same to persons not entitled to wear it.” In fact, even some officers who were qualified to receive the medal had difficulty in proving that they were entitled to it. For instance, Lt. Robert McWade (40th New York) was required to provide a testimonial from his commanding officer before being allowed to purchase his medal because his name was written as “McQuade” on the list of qualified recipients. So it seems unlikely that Capt. Lyon could have surreptitiously received one. There are several known cases where an officer received more than one copy of the medal. Some were lost/stolen and replaced and one officer is actually listed twice on the qualifying list. Perhaps Capt. Lyon received a duplicate medal from one of his fellow officers? There are even some 19th-century companies that were known to offer forgeries of the Kearny Medal – but what self-respecting officer of that stature would subject himself to a charge of “stolen valor” from his peers? Perhaps the medal on his chest in the photo isn’t a Kearny Medal after all? The inset is provided for your examination. I don’t have the answer. Previous posts to this blog and to my Facebook page about the medal have inspired some living descendants and fellow researchers to contact me with details or photographs of a recipient. Maybe this post will have the same effect. Please contact me or comment below if you have evidence or even a theory that would explain this mystery. *There was reportedly nothing to prevent an officer from paying more money to have gems inset into his medal or to customize the length of the ribbon, etc. Presumably, an officer with lesser means might likewise forego the ribbon and top bar, for instance, in order to pay less money for his medal. It is not uncommon, therefore, to see photos of the drop or planchet of the medal being worn as a pin – as in the photo above.